Can You Golf After Neck Fusion Surgery? Is It Possible to Golf Again After Having Neck Fusion Surgery? The windup and follow-through required for a typical golf swing places a lot of stress on multiple parts of the spine. After having minimally invasive neck surgery, Beverly Hills patients may discover activities like this can be even more stressful for a healing neck. As you advance through recovery, you may wonder if you will be able to tee off again safely at some point. Here’s what you need to keep in mind if you want to achieve this goal. It usually takes about three months for a fusion to form after neck surgery. Your surgeon will track the progress of your fused cervical vertebrae as the fusion continues to strengthen, which usually takes about a year. Since golf isn’t a contact sport, you may be cleared to play again in as little as three months, provided your fusion is progressing as expected. As you return to golf, take some precautions to minimize the risk of re-injuring your neck. This includes doing warm-ups (e.g. gentle neck and arm stretches, upper back and hip rotations) before you play a game. Avoid over-rotating and excessively extending your reach with each swing by using a shorter swing range. Also, avoid standing or swinging on uneven surfaces that could throw off your spinal alignment. If your doctor gives you the okay to return to the golf course, ease your way back to your previous playing capabilities and keep the modifications and precautions mentioned above in mind. Take a break if your neck pain returns to allow muscles to naturally heal. Report any discomfort that comes on suddenly after a round or two or if neck pain gets worse even after you’ve rested for a few days, especially if it’s within the area where you had your fusion. 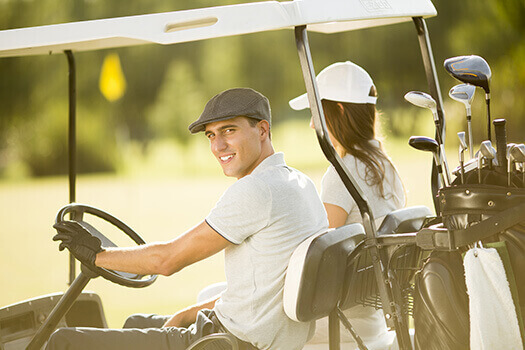 After sustaining an injury to your neck, if you want to return to playing golf or engage in another physical activity, you may need to consider fusion surgery or a spinal fusion alternative. Beverly Hills residents can trust in Dr. Hyun Bae at The Spine Institute Center to diagnose the source of their pain and get them started down the path toward a pain-free life. Call our office today at 310-828-7757 to schedule an appointment.